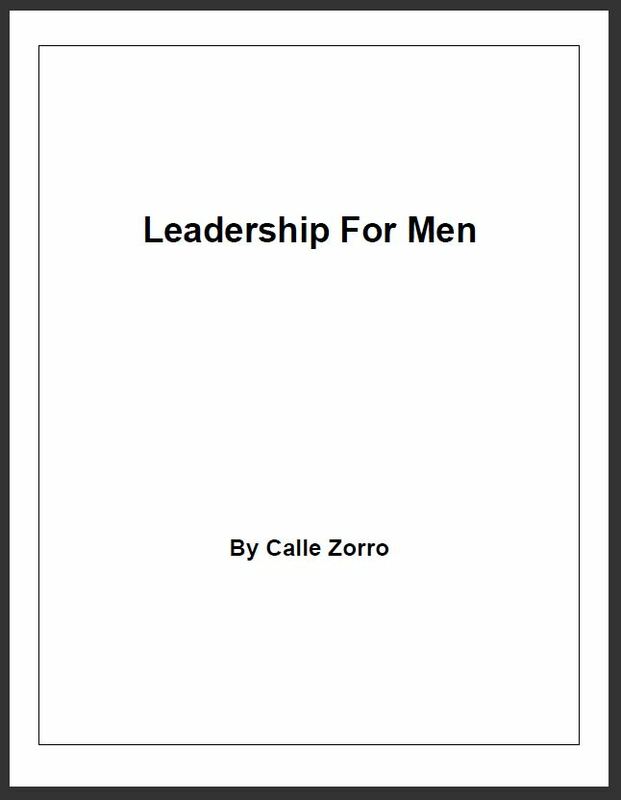 Calle Zorro Leadership For Men Are you ready to settle once and for all what leadership really is…and how to be a powerful, influential, effective, and attractive leader in any setting…including with your wife and children? Are you ready to take your leadership ability to its highest level so that you can have the enjoyment, rewards, benefits, and opportunities that come with being a top-notch leader? Are you ready to enjoy the best relationships, experiences, and outcomes with your wife and children? And, are you ready to get the best results and the greatest production from people in your professional environment? If yes, then this comprehensive eBook is for you. Are you ready to settle once and for all what leadership really is…and how to be a powerful, influential, effective, and attractive leader in any setting…including with your wife and children? Are you ready to take your leadership ability to its highest level so that you can have the enjoyment, rewards, benefits, and opportunities that come with being a top-notch leader? Are you ready to enjoy the best relationships, experiences, and outcomes with your wife and children? And, are you ready to get the best results and the greatest production from people in your professional environment? If yes, then this comprehensive eBook is for you. A man’s level of “leadership ability” determines the level at which he gets to enjoy life … both personally and professionally. The man with low leadership ability will be stuck on the lower rungs of enjoyment and opportunity in life. Conversely, the higher a man’s leadership ability, the higher his enjoyment and opportunity in life. This is true because the higher a man’s leadership ability, the better he is at getting what he wants with and from people. If you are actively enjoying all the experiences, outcomes, relationships, and things in life that you want to enjoy … then the dominating reason is because somewhere along the way, you developed sufficient leadership ability to create or attract … and to retain … these experiences, outcomes, relationships, and things. In contrast, whether personally or professionally, if there are experiences, outcomes, relationships, or things that you want to actively enjoy … but you have not been able to make them a part of your reality, then the dominating reason is insufficient leadership ability. Are you completely satisfied with the level of enjoyment and opportunity in your life? Are you totally enjoying all of the experiences, outcomes, relationships, and things in every area of your life that you want to enjoy? Are you fully able to lead in your personal life such that you enjoy the exact personal relationships that you want to enjoy with your lady, your children, your family, your friends, and your colleagues? Are you fully able to lead in your professional life such that you are getting the exact performance and production from people that you want to get? If you are completely and totally satisfied with your leadership ability in response to each of these questions, then there is no reason for you to continue reading. On the other hand, if it is possible that your leadership ability could stand some improvement … if it is possible that there are better experiences, outcomes, relationships, and things for you to enjoy … if it is possible that you could get better results with, through, and from people … then it is definitely worth your time to keep reading. How do you get people to do things for you that you want them to do? Similarly, how do you get people to go along with whatever it is that you want to do with them? These two questions have vexed men in every era of time. And yet, there is the occasional man who easily gets other people … whether it is his woman, his employees or co-workers, his banker, or anyone else he is dealing with … to go along with him in whatever he wants from them or with them. This man is a leader! This man is a leader who can lead the experiences, outcomes, and relationships he wants with people. More specifically, this is a man … who at some point in his life … made it his business to acquire the secrets to getting what he wanted from and with people. And, I propose that it is time for you to GET ALL THESE LEADERSHIP SECRETS NOW so that you can get more from and with people too. Have you ever needed to learn an important subject … a subject where proficiency meant good things in your life … and incompetence definitely meant unwanted consequences? And, in trying to master this subject, did you ever find yourself studying learning materials that were sort of helpful … that had some good points … but honestly, they did not fully or clearly explain the subject … and they certainly did not make you proficient? As a result, did you find yourself searching for better learning materials … because you understood that your well-being and your future depended upon you gaining proficiency in the subject? And, did you ever have the experience where you finally found “it” … that one special resource … created by some unusual person … a person who thoroughly understood the subject matter … who had the ability to convey important knowledge to you in simple, easy-to-understand, clear terms … and this one resource gave you the proficiency you was seeking? Also, if you have had this experience, do you remember how after that, you just had it. After that, there was no longer a need to study the subject or to search for additional learning materials because you finally had full understanding and full proficiency in the subject? Well, this page is about that exact resource in the realm of leadership. This is about a leadership program that is so enlightening that after you have went through it, you will never again search for anything related to leadership help. You will not because you will have such an understanding of the subject that no additional help will be needed. A person who has become a multi-millionaire no longer looks for help on “how to become a millionaire” … and in the same fashion, you will no longer be looking for help on “how to be a leader” or “how to be a more effective leader” after you have went through this program. Just so it is clear, this program is specifically for men only … men who want to be better leaders in their marriage and family, in their business, in their community, in their region, in their country, or in the world. Now, that is a pretty broad range, but true leadership is the same in any scenario … and the only difference is one of degree and scope. It is like the principles of money. The number of digits can be drastically different for a household compared to that of a city, state, or nation … but ultimately, the concepts of financial well-being are exactly the same. Then, this is the leadership program for you. Which Of The Following Could You Benefit From Knowing? What exactly is leadership? What is the actionable definition of leadership that once you have it, you will just know how to be a leader? What exactly does a leader do … and not do? How specifically does a leader inspire people so they self-start and self-motivate? How does a leader get the best and the most from people? How does a leader get people to perform, participate, support, contribute, and augment? How does a leader get people working on important objectives with him? How does a leader get people into unity, harmony, and alignment with his chosen objectives? How does a leader get people engaged and activated in what they are supposed to be doing? How does a leader get out of the mode where he is constantly having to beg, push, or prod people? You would like it if there was no longer a need to beg, push, and prod people because they were eagerly doing what they were supposed to be doing, wouldn’t you? What exactly is power … and how does a leader establish proper power within his environment? How does a leader turn failures into successes? How does a leader get people to let go of a bad past and open up to a good future with him? How does a leader get people to stop wasting time? How does a leader get people to stop being distracted? How does a leader get people to stop procrastinating and engaging in other such non-productive behaviors? How does a leader discern between activities he should take on and those he should delegate? How does a man lead successful outcomes when he is not the “official” leader … when he does not have position, title, authority, or control? What is the proper way for a man to lead his wife and children into good relations, experiences, and outcomes with him? How does a leader identify what is the right direction … whether for his family or for the enterprise with which he is associated? When people are seemingly going in every direction except the right direction, how does a leader get people committed to the right direction? How does a leader get people to give him relevant, useful, important, and accurate information in a timely fashion? Confidence is essential in leadership. The question is, how does a man become more confident? Decisiveness is also essential in leadership. But, how can a man be decisive in the face of uncertainty and the unknown without making a fool of himself? How does a leader get free of all the work and details so that he can actually provide leadership? How does a leader overcome fears he feels within himself? What is the proper way to deal with and relate to other leaders? What are the main mistakes would-be leaders make that destroys their ability to lead and get good results from people? When people have nothing in common, how does a leader get people cooperating and working together? What are the most important questions a leader should be asking himself on a regular basis … and he is headed for trouble if he is not asking himself these questions? How does a leader recognize emerging trends so that he can prepare for them or capitalize upon them? Empowerment is a buzz-word that is bandied about a lot in business circles … but how exactly is a leader supposed to really empower people such that it really does change people’s behavior and their results? How does a leader make sure the people he brings into his world are winners and producers? Why is it that a leader should never try to convince some hot-shot to join his team? What is the proper way to deal with a non-performing, non-contributing person? from the people you already have. How does a leader draw opportunities to himself and his group? How does a leader structure success within his sphere? How does a leader turn critics into contributors and allies? How does a leader change negative people into positive people? How does a leader get people to commit to him and his cause? How does a leader rid his environment of drama, issues, and problems? How does a leader get people to accept, embrace, and support change? How does a leader get people to voluntarily and willingly get on-board with his goals and objectives? How does a leader change a resistant person into cooperative person? What are the common mistakes would-be leaders make … that they are not even aware they are making … that demotivate and turn people against their goals and objectives? How does a leader expand people’s comfort zone so that they can be more and do more? Why is it that trying to please people is one of the worst mistakes a leader can make? Leadership is not about being a genius with special powers. It is about something else entirely … something that any normal, average person can do with ease. Do you know what this something is? What are all the motives people have? How can a leader tap into the motives people have and benefit from them? What is the reason a leader’s environment will fall apart … and what must a leader provide in order to prevent his environment from falling apart? How does a leader get himself and his group unstuck when they get stuck? Everybody knows that people become passionate contributors when they are a part of something that is bigger than their own self. The question is, how does a leader create an environment that people really believe in and passionately contribute to? There are some men who struggle to lead even when you drop them into a perfect environment. There are other men who can lead okay as long as they are in a good environment and the circumstances they are dealing with are also good. And then, there are those rare men who you can drop into any environment … including the worst kind of environments … with the worst imaginable situations … and in a short while, they have everything turned around and they are running a top-dog, high-performance, high-production organization. The question is, what is the secret behind their amazing turnarounds? How do these rare individuals take a bad environment filled with bad situations and transform it all into something incredible and awesome? Well, if you are in a struggling environment and you are dealing with difficult situations, this one should be of particular interest to you. What leadership is NOT. The first step to understanding leadership is to understand what is not leadership. Clients tell me they found this section to be profound, powerful, and eye-opening. What leadership IS. If you want to befuddle someone, ask them what leadership is. It really is incredible how even people in top-level leadership positions cannot really articulate what leadership is. But, once a clear understanding clicks in your mind about what leadership is, then you will forevermore think and act like a leader. This section makes sure you get that “click”. The mindset of leadership. The reason so many would-be leaders struggle and are unsure of how to lead in the situations they find themselves in is because they do not have a leadership mindset. But, once you have a leadership mindset, then what to do becomes easy and straightforward … no matter what kind of situation you find yourself in. This section is designed to give YOU a leadership mindset that is the real deal. How to create a compelling vision. By the time you finish this section, you will be one of those larger-than-life “visionaries” … one of those rare individuals who possesses the magical ability to craft a powerful vision out of seemingly nothing … one of those amazing individuals who has already come up with exactly what to do while everyone else is still trying to figure out the situation. Leadership-style communication. Forget about all the shallow, inane communication tips or teaching you have encountered elsewhere … the kind of junk that is so simple, basic, and obvious that it is just absurd and a waste of your time … not to mention totally boring. What you get here is the kind of teaching that is actually interesting and useful to you … like how to communicate with people in a way that changes them, moves them, engages them, and activates them. Also, realize that everything you want to have happen under your leadership can only come about as a result of powerful, impacting communication. After you finish this eye-opening, awareness-expanding section, you will know exactly how to communicate in this way so that your communication ability works for you and serves you. How to handle people. As the old joke goes, “Leadership would be easy if it wasn’t for people.” Well, the fact is, people are a permanent part of the leadership equation. So, the sooner you master the ability to deal with, relate to, interact with, and handle people … such that they align with you in a positive, participative, contributive, productive way … the sooner you can get to all the good outcomes and experiences you are wanting in your life with people. How to influence and persuade people. This is where I go deep into precisely and exactly how to get people to do what you want them to do. In this section, you will find the 29 gambits by which you can shift and change how people think and what they do. Here is what I can tell you: no man can be a true leader until he has mastered the ability to influence and persuade people. This section gives you everthing you will ever need on this subject. Next, you should know that this is a serious leadership program. This is a professional-level, full-featured program. This is a program designed to develop you into a top-notch leader. This is definitely no joke of a program. The eBook itself is a comprehensive 386 pages. Bluntly, if you want lightweight fluff, then you will have to go elsewhere because there is no fluff here. How Is This Different And Better From Other Leadership Development Options? Let’s start with how it this is different. With OTHER leadership development options, you can attempt to learn from a book (or several books) … and good luck … hope that works for you … because that is all you get … you are all by yourself with no one to help you or answer questions for you. Or, you can pay thousands of dollars for private consulting. Or, you can pay thousands of dollars for a non-personalized public seminar (plus downtime and travelling costs). I will give you more detail below, but for now, understand that this IS different because this is a three-dimensional (3D) leadership program that provides you with everything you need to develop into a top-notch leader who gets the results with people that you want. There is another aspect to how this is different. The typical book-writing formula is to take a given topic … create an outline of roughly 10 sub-topics … which become chapters … and then, for each chapter, come up with 3-5 points … and then flesh out each chapter by describing each point and giving examples of each point. In this model, a book that is considered “good” is a book that makes good points. The problem is, “good points” rarely ever make a person an expert on the book’s topic. To illustrate, “Think and Grow Rich” by Napoleon Hill is a well-known, very-popular book in the business and success genre. This book specifically covers 13 principles … and yet, most people who have read this book cannot recall or describe even a single principle. As another illustration, most everyone has heard of the highly-popular book “How To Win Friends and Influence People” by Dale Carnegie. And as before, many people who have read this book cannot recall even a single point or concept from it when asked. What this means is that these books made some “good points” … but they did not really change or affect people’s lives very much. Now, I am saying this … not to belittle other authors … but to let you know in advance that I want a different outcome for you relative to this leadership program I am telling you about. Specifically, I have purposely designed this program so that by the time you have went all the way through it, your mind has been programmed with a leadership mentality. I have purposely designed this program so that your way of thinking, representing, processing, operating, and interacting gets infused with leadership principles as you go through it. I have purposely designed this program such that by the time you finish it, you are able to just go BE a leader who DOES leadership things … instead of trying to remember what the “good points” were … or exactly what it was that you were supposed to do in order to be a leader. There is yet another aspect to how this is different. THIS leadership program is for men of all levels of leadership ability. This program works whether you are at the lowest level of an organization … or at the very top level … or anywhere in between. This program works if you have never been a leader … or if you have been in a leadership position for a long time. With THIS program, you can begin exercising leadership regardless of your situation, circumstances, or conditions. No matter what your environment or position, you can become a leader with this program … or you can expand and maximize your leadership ability and effectiveness if you are already a leader. This is true because THIS program goes to a more fundamental understanding of leadership … this program goes to a more cellular level … in comparison to OTHER programs … so that a man’s leadership ability is expanded and maximized regardless of his level of understanding or experience. To explain what I mean … think about the difference in size between your cell phone’s screen … and the size of your computer’s screen. The sizes are very different … but you can pull up a picture on either device … and you can “zoom”, enlarge, and expand the size of the picture so that it is “bigger”. Well, in the same fashion, THIS leadership program does not care what the “size of your screen” is. It simply gives you the ability to enlarge and expand your leadership ability. According to these definitions, a leader is someone who influences and induces multiple other people to accomplish goals or projects envisioned by the leader. Now, while these are not very actionable definitions, you can intuitively recognize that they are true in certain NARROW situations and circumstances. But at the same time, you can also intuitively recognize that there are problems with these definitions. You can perceive that something is not quite right … that something is missing … that these definitions do not quite go deep enough … that while they may fit a specific slice of the world, they do not really fit the real-world as a whole. In fact, as a man, you probably recognize that leadership is far more fundamental, pervasive, and necessary in the living and conducting of life than just leading a work-group. You probably recognize that there is more to life than just inducing others to accomplish goals and projects. You probably recognize that there are parts of life where leadership is important and needed … but inducing people to do your bidding is not appropriate and there are no goals or projects to be completed. As a specific example that most men are familiar with first-hand, consider a marriage. What do you think is going to happen if you treat your wife as if she is a “project” or a “goal”? Or, what do you think is going to happen if you are constantly trying to induce your wife to be a good “employee” who does your bidding? And yet, you no doubt understand instinctively that deep, powerful leadership is not only needed in a marriage, it is in fact essential and required if a marriage is to work properly and enjoyably. There are a lot of guys who are in leadership positions in their workplace who are okay at what they do. But, when they walk through the front door of their house … and they start interacting with their wife or their children … it is as if they have next to zero leadership ability. Too often, when these guys walk through the front door of their house, they are no longer the “leader”. Instead, their wife is running the show … or maybe their children … and they do not have a clue about how to regain leadership of their family. Well, the relationships you have with your wife and your children are the most difficult relationships you will ever be in … because pretending does not work … because free-will reigns … because there is no hiding who and what you really are … and because you have limited control and power over family members. What this means is that when you learn how to be a leader who can create good results and outcomes with his wife and children, then I can promise you that is when you will also be a titan of a leader in other realms. The fact is, leading in a work-group setting is the easiest leadership scenario there is. It is the easiest because everything is pre-arranged and pre-powered to help and support the person in the leadership position. But, how well can you lead when all that help and support is gone? How well can you lead when that position and power is gone? How well can you lead in all the other areas of your life besides your work-group life? Well, THIS program is better because it will set you up to be a powerfully effective, influential, and attractive leader in all the other areas of your life where only a true, real leader is allowed to lead! THIS program is better because it sets you up to be a real leader across the whole spectrum of your life … both personally and professionally. Certainly, THIS program sets you up to be a top-notch leader in your business life. But equally as important if not more important, THIS program also sets you up to be a top-notch leader in your marriage and family setting … in your personal interest settings … in your religious affiliations … in your political affiliations … and all the other important areas of your life. Bottom line, you are more than just a guy in a work-group. Is not it time for every area of your life to benefit from you having real leadership ability? With OTHER leadership development options, some leadership pundits divert the focus onto the “special powers” of a leader. In these OTHER options, pundits proclaim a leader to be a magical, extra-special person … a legend … a champion … a star … a one-of-a-kind individual. In other words, according to these pundits, a leader is someone who is somehow gifted with exceptional, matchless talents and abilities that raise him or her up above the mass of mere mortals. But in reality, we know this is not true because history is filled with examples of common, every-day individuals of no renown and low-end intelligence who provided spectacular leadership in the circumstances and conditions they found themselves in. Clearly, there has to be a deeper, more fundamental, more usable definition and explanation of what leadership really is. Well, there is … and THIS leadership program is going to reveal that definition and explanation to you in clear, simple, direct terms … so that by the time you are finished with it, you will know precisely what leadership is and exactly how to be a leader in your own unique way. And just so you know, any person with an average intellect and a normal emotional capacity is well-able and fully-capable of being an excellent leader. By the time you finish THIS leadership program, you will know exactly how to be such a leader. At this point, I want to make something very clear. I am NOT here just pitching you a eBook and then telling you, “Good luck, hope it works out for you.” ABSOLUTELY NOT! That is NOT what I am doing. That is NOT how I do business. That is NOT how I help you become the leader you want to be. The eBook reveals what to do, why you do it, and how to do it. It gives you the explanations, the clarity, the understanding along with the strategies, tactics, and techniques needed so that YOU end up a powerful, effective, influential, transformative, attractive leader who gets the most and best from everyone around you. But, sometimes a man needs more … sometimes he needs customized help … help that is specific to HIS situation and circumstances. This forum is your back-end support depot … this is the “place” where you get any personalized help you need. There is another important aspect to this forum: you cannot help but refine, improve, and expand your own leadership ability just from interacting with other leaders and reading the things they write about in the forum. In the same vein, hanging out with other leaders on a regular basis helps you keep your own leadership ability sharp and tuned-up. It is common knowledge that a person can “get rusty” … and this forum is how you keep the rust knocked off. There is still another important aspect to this forum. Sometimes, a leader needs a safe, private, and secure sanctuary and refuge … a haven where he can go for support, renewal, encouragement, and up-lifting. Maybe he just needs to vent some of the frustrations he is dealing with. Maybe he is faced with some special situations and would like some feedback from other experienced leaders. Maybe, he just wants to hang out with other leaders who understand him and what he is going through because they are going through similar things. This is a really big deal … because when you are the leader, everybody in your sphere gets to come to you when they need to talk … when they need to vent … when they need guidance … and so on. But, what about you? Where can you go? Who can you talk to? Well, for a lot of leaders, there is nowhere they can go … and nobody they can turn to. But, with this Private Online Leadership Forum, you ALWAYS have a place you can go. And, you ALWAYS have other leaders you can confide in … all within a safe, private, and secure setting. One, you can visit the forum at any time of the day or night. During the day, you are sure to find other leaders online in the forum. But, we men can hold some pretty crazy hours sometimes … so even when it is the middle of the night, a weekend, or a holiday … it his highly likely that you will find other men are online as well. Two, your membership in the forum is good for as long as you wish to remain a member. That means if you find yourself wanting help or support five months from now … or five years from now … well, we will be right here ready to help and support you. Is it starting to sink in that this is exactly the right leadership program for you? The eBook will give you the clarity and understanding that you need to become a powerful, influential, effective, and attractive leader. The private forum will give you even more clarity and understanding about how to become a powerful, influential, effective, and attractive leader … along with the on-going help, support, and sharpening it provides. So altogether, this leadership program is a SYSTEM of components … all designed to work together … to ensure that YOU successfully gain a full understanding of how to be a great leader in any environment or setting. Now, Are You Ready To Enjoy The Rewards, Benefits, And Opportunities That Come With Being A Great Leader? On both a personal and a professional level, ask yourself … are any of the following are true? I am ready to take my leadership ability to its highest level so that I can have the enjoyment, rewards, benefits, and opportunities that come with being a top-notch leader. I am ready to enjoy the best relationships, experiences, and outcomes with my wife and children. I am ready to get the best results and the greatest production from people in my professional environment. I am ready to expand my leadership ability such that I stand head-and-shoulders above any other leaders around me. I am ready to smooth out my ability to get people to join up with me and to go along with me. I am ready to be great at inspiring, influencing, and persuading people. I am ready to see the people around me perform, participate, support, accomplish, and contribute more. I am through with begging, prodding, and pushing people to go along with me … and I am ready for people to willingly and happily go along with me. I am ready to be able to lead people out of negative mindsets and negative behaviors … and get them thinking and acting positively around me. I am ready to have real courage and real confidence … the kind that is genuine and authentic. I am through with being the one who does most everything while others do hardly anything. "This book opened my eyes to what the true meaning of leadership stands for. It showed me things that I thought I knew and things I had never considered. It taught me how a leader thinks, acts and behaves in ways that my conditioned mind was simply not opened too. It had more examples of leadership than I ever knew existed. It brought out many thoughts of my life and how I could have handled things in such a different way...and gotten dramatically different results. It made me aware of things that non-leaders do in myself and others and the importance of my ability to step up and lead not only in my professional life, but also in my personal life. The most important thing this book taught me was that leadership is a state of mind...a way of being. This book not only showed me leadership-how, but it ingrained leadership into every part of my mental thought process. Well done Calle Zorro, one of your best works so far!" "Calle's latest program "Leadership For Men" introduces and defines leadership in a simple, thorough, and most importantly complete way. Calle defines "Leadership For Men" in a way that few others are capable of expressing. Think about it men, how many times have you asked a colleague, boss, or mentor to define leadership and all you heard was the standard but incomplete and not-very-usable textbook description? If you have any of Calle's other books, then you know they contain many leadership principles–although he does not identify them as such. But, in "Leadership For Men", he totally pulls back the veil and clearly identifies exactly what leadership is and exactly what the mindset, behavior, and attitude of an effective leader is. What I find really special about "Leadership For Men" are the tools that Calle helps you build relating to communication, team building, and the "how to" of influencing people. As an accomplished leader of cohesive, effective, high octane organizations over the last 20 years I was majorly impressed to see these three topics explored so thoroughly. They are the essence that a leader must master to lead effectively, successfully, and in a way that people will decide to follow you."